Washington DC (VNA) – Vietnamese Ambassador to the US Pham Quang Vinh held a meeting on January 10 with US Congressman Paul Gosar who affirmed that Arizona State is willing to boost cooperation with Vietnamese localities in all fields, including energy, in order to take advantage and supplement each other’s strengths in technology and resources. Gosar is a representative of the Republican Party in Arizona State, President of the House of Representatives’ Subcommittee for Energy and Mineral Resources and a member of the House Committee on Oversight and Government Reform. Both Vinh and Gosar agreed that relations between the two countries as well as between Vietnamese localities and Arizona State have been developing strongly and there is still lot of potential for cooperation, especially in green and renewable energy. 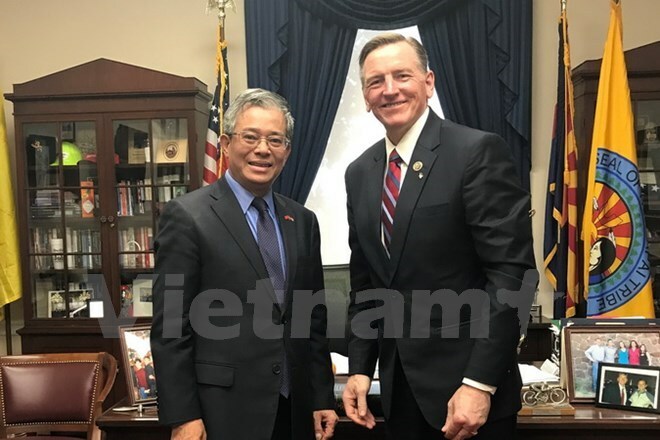 Gosar recalled his sound memories and profound impressions during his visit to Vietnam in late 2017. Vinh said that Vietnam hopes to welcome more US congressmen, thus contributing to the development of Vietnam-US ties. A day earlier, Vinh met with Assistant Secretary of Defence Randall Schriver. The two officials lauded the growing relationship between the two countries over the past year, especially the successful visit to the US by Vietnamese Prime Minister Nguyen Xuan Phuc in May 2017 and the Vietnam visit by US President Donald Trump and his attendance in the APEC Economic Leaders’ Meeting in November 2017.